Arthur is a strong and tough-looking young man who has always been, well, odd. Perhaps the first clue during his childhood came at the Boston Aquarium, where Arthur began talking to fish. When his friends bullied and teased him, a shark rammed the glass, scaring the boys away. But Arthur himself always has known he was unique. His father was a lighthouse keeper, while his mother was Atlanna, the queen of the underwater world Atlantis. Arthur is a “half-breed” who doesn’t fully belong in either world. As part-human, he can breathe air, but as part-Atlantean, he can breathe water, too. Yet now Arthur’s half-brother -- Orm of Atlantis -- is trying to unite the seven sea kingdoms to launch a war against humanity. The peace that Arthur’s mother desired seems like a fantasy. Arthur has the power to stop Orm, but will he succeed? The DC Comics film Aquaman (PG-13) opens this weekend, starring Jason Momoa as Arthur/Aquaman; Amber Heard as Mera, his romantic interest; and Patrick Wilson as Orm. In an era of homogeneous city-dwelling superheroes -- like Superman, Spider-Man and Iron Man -- different is good. From beginning to end, Aquaman has a unique look and feel. This begins with the underwater scenes, which show Arthur and the Atlantean people talking and interacting as if they were above water. They're human-like creatures with fish-like abilities. They breathe water, but they talk just like you and me. It's a weird, cool and amazing film trick that only Hollywood could create. The underwater worlds -- led by the city of Atlantis -- are beautiful. Then there's Aquaman himself, who performs superhero feats that our air-breathing heroes -- that's you, Spider-Man -- could never try. The superhero world needs a water-dwelling warrior. Right? Hopefully, parents already know that DC and Marvel movies have tons (and tons) of violence. Aquaman is no different. The fight scenes aren't as gruesome as those in Black Panther, but they're violent nonetheless. The film starts with Aquaman whipping a dozen or so marine pirates who had overtaken a submarine. Then we see him battle his brother in a fight-to-the-death match. The movie concludes with a lengthy underwater battle that would rival anything on land or in outer space. Throughout the movie, we watch him use his trident -- that's his pitchfork-looking weapon -- to spear people. It's mostly bloodless, but it's something I wouldn't want my youngest children watching. The film also has about 18 coarse words. Although Aquaman is void of sexuality, the lead female characters wear revealing outfits. The first half of the film -- which includes Arthur's backstory -- is better than any modern-day DC Comics movie (yes, even Wonder Woman). We learn how his parents met. We see him discovering his powers. We watch him as a child at the Boston Aquarium. And when he grows to adulthood, we enjoy special father-son moments of him and his dad bonding. The film is strongest when there's a mixture of land and ocean scenes. Perhaps that's the problem in the second half of the film, which is dominated by CGI battles and mythological details. We escape the land. A war ensues. The story gets lost. The movie is two hours and 22 minutes. That's too long. You likely wouldn't invite Arthur/Aquaman to your child's birthday party. Well, unless he pledged to be on his best behavior. He loves to drink. He loves to curse. He loves to fight. He'd make a great professional wrestler if the bouts were on the ocean floor. But beneath this tough-man facade is a superhero with positive traits. He saves the good guys and tells the sea pirates: "You killed innocent people." He loves his father and mother and isn't afraid to express his affection. In contrast to his half-brother Orm, he's humble and doesn't want to become king. He's a bar-hopping superhero who wants justice. He's not wholesome like Captain America, but he's not Deadpool, either. Let me explain. The film follows two angles: 1) Orm's drive to launch a war with humanity, and, 2) land-dweller Manta's desire to hunt and kill Aquaman. Manta is a sea pirate who survives a battle early in the film that resulted in his father's death. He blames Aquaman. Because Manta breathes air, he must rely on high-tech equipment to fight his underwater battles. 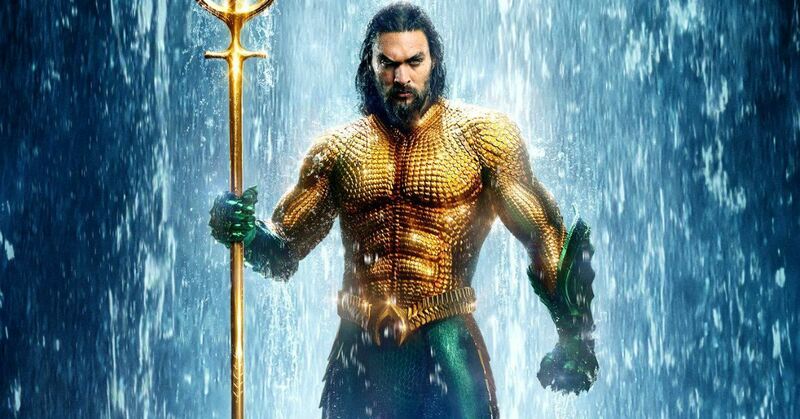 I'll stop here to avoid more plot-spoilers, but by the end of the film, it's obvious that an Aquaman 2 is in the works. But you'll have to stay in your seats. A mid-credit scene explains everything. All images courtesy: DC Comics / Warner Bros.